In the elementary classrooms, our small class size allows each student the opportunity for individual instruction, differentiated learning, and the time to expound on curriculum. Students learn through hands on activities, interactive games, and curriculum and skills based projects. Classrooms have technology available such as SMART boards, ELMO projectors, and Chromebooks. Grade levels get to interact during lunch, recess, and special activities. Special activities include music, performances, art appreciation, P.E., STEM classes, library, drama/fine arts and weekly chapel. In addition to our challenging curriculum, the lower elementary classes experience learning through fun field trips to the farm, plays, 100th day of school celebrations, and Dr. Seuss day activities. On a daily basis, our students spend their time mastering basic math, phonics, writing mechanics and manuscript, reading comprehension skills, Social studies, Science, and Bible memorization. As well as expanding students’ prior knowledge, upper elementary students meet a challenging curriculum that includes daily Latin class, cursive writing instruction, research projects, essay writing, and oral presentations. 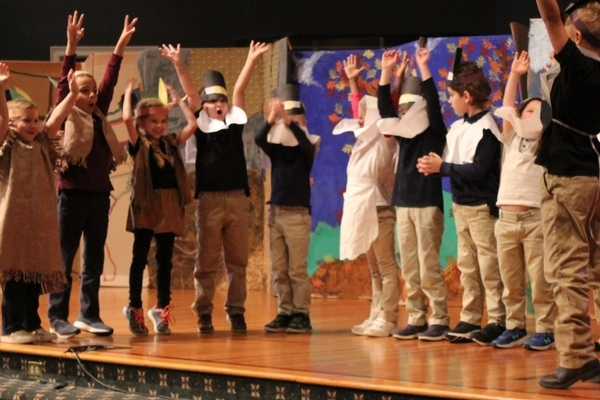 Students also participate in dramatic readings, Bible verse memorization, and puppetry.